A three-sport Most Valuable Player out of Immokalee High School, Albert Bentley is a study in determination and success...after two years as a walk-on to the Hurricanes football team, Albert was awarded a full scholarship after the Spring of 1982 and was named the starting halfback for the 1983 season...a season that will never be forgotten by Hurricanes fans. He led the 1983 Canes with 722 rushing on 144 attempts for a 5 yards per carry average and 5 touchdowns. He also caught 32 passes for 294 yards and another touchdown. Always wanted to contribute in any way possible, Bentley also returned 5 kickoffs for 74 yards. The three-year Miami letterman had his best game against Louisville with 152 yards rushing on 18 attempts with 2 touchdowns. Against Duke, he had 83 yards rushing on 8 attempts for a 10-yards per carry average, 3 catches for 57 yards and two returns for 42 yard on kickoffs. In the National Championship game against the Nebraska Cornhuskers in the 1984 Orange Bowl Classic, Albert had his usual all-around outstanding performance with 46 yards on 10 carries, three receptions for 36 yards and a 24 yard kickoff return. But his most important contribution was scoring on a 7-yard touchdown run to put Miami in the lead 31-17 over Nebraska. That score proved to be the winning touchdown as the Canes held off a furious 'Husker comeback to win the game 31-30 and claim the school's first football National Championship. Albert spent 2 years in the United States Football League (USFL) and the, having been drafted in the 1984 National Football League (NFL) Draft by the Indianapolis Colts, he went on to play 8 seasons with Indianapolis and Pittsburgh in the NFL, amassing 2,350 rushing yards, 2,250 receiving yards and 3,200 kickoff return yards. He currently lives in Naples, Florida and works as a financial consultant. 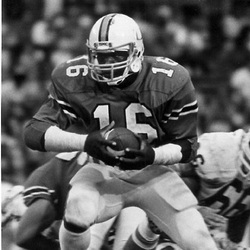 Albert Bentley will always be remembered as one of the key members of the University of Miami Hurricanes 1983 National Championship football team.